You're going to love your bed! Sateen sophistication For silky, soft warmth this winter, try sleeping with any of these extraordinary Egyptian cotton sheets or may we suggest Tencel® Lyocell for an extraordinary experience.
. . . on a featherbed . . .
Our pillows are made using only the finest quality down fills. Washed and processed in the U.S.A. Covered with world-famous European downproof fabric. All DEWOOLFSON Down pillows are sewn, filled and finished within 48 hours for shipment from our North Carolina factory. â&#x20AC;Ś Choose soft, medium, or firm, or have one stuffed to your heartâ&#x20AC;&#x2122;s content! If your DEWOOLFSON down pillow is not perfect, return it for adjustment any time within one year of purchase, charging only for additional down. 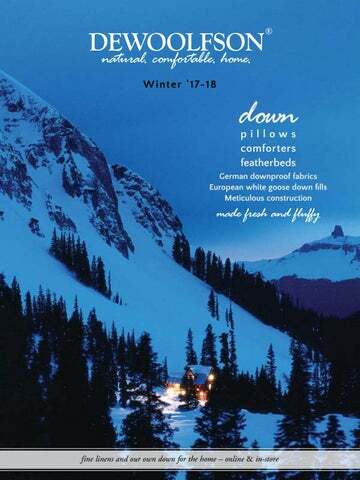 Famous for our pillows for over 30 years. LATTICE :: One of BRAHMS MOUNT's softest blankets. cotton/ wool blend Made in the U.S.A.
NERINO :: 100% super-fine Merino wool. Yarn-dyed. Double-faced wool woven binding. Washable. DEWOOLFSON :: Warmer than cotton and cooler than a down comforter - white down blanket with satin binding is the ideal transitional layer. Washable. DEWOOLFSON® 9452 NC Highway 105 S. Banner Elk, NC 28604 U.S.A.
© 2017 DEWOOLFSON DOWN INT’L., INC.